As runner-up in the Meadow Fresh New Zealand Barista Championship 2018, Nico Refiti of Ozone Coffee was invited by the organisers of the Fushan Cup International Barista Championship to fly to China to compete. The competition has been running for seven years by the local government. 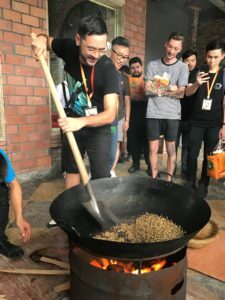 It is the same format as the World Barista Championship and an invitational competition for competitors who have performed well at a national level, so while not everyone is a champion, there’s an expectation of a high standard of performance. What is the Fushan cup and how did you get involved with the competition? 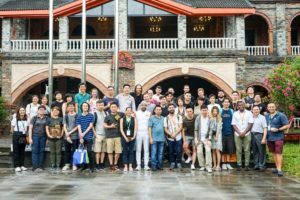 The Fushan Cup International Barista Championship is a competition organised by the People’s Government of Hainan Provence to engage both Chinese and international baristas and showcase Fushan as a coffee producing region. This year, nine Chinese and 14 international baristas took to the stage in a World Barista Championships format. About two and a half weeks before the competition I was approached by the NZSCA to represent New Zealand at the Fushan Cup as runner-up at the Meadow Fresh New Zealand Barista Champions. With such an amazing opportunity to compete internationally (with all expenses paid! ), it took me all of two hours to clear out my calendar and commit to the competition in China! Had you ever participated in any coffee competitions before? Which competitions were they? I’ve competed at New Zealand Barista Championship for the last four years now with three semifinalist finishes and this year I placed second behind John Gordon. I’ve also competed at New Zealand Aeropress Championships, judged at New Zealand Latte Art Championships and been involved organising, competing and judging various other local coffee competitions. What is your most memorable coffee experience? While I have many memorable moments in coffee competitions, I distinctly remember the breakthrough I had in my sensory evaluation of coffee. 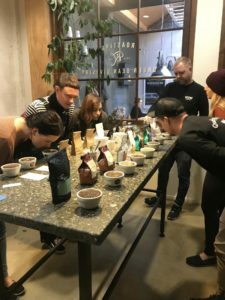 I had been joining in on our regular cuppings at Ozone Coffee Roasters for several months, tasting the various single origins we were roasting and listening to the sensory team on their opinions on the coffees. One day we had a fantastic washed Ethiopian coffee that had a distinctive and familiar flavour note that I was struggling to put my finger on. I remember tasting this one set of cups over and over again. Finally, it came to me: ripe papaya. It wasn’t just recognising the flavour but I was hit by the memories around that flavour. I was experiencing the same flavour in this coffee as I had tasted at the buffet breakfast at the Tanoa Tusitala Hotel in Samoa, papaya ripened on the tree and served the same day it was picked. 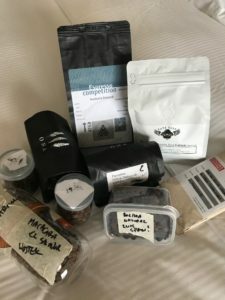 While I had previously agreed with other people’s tasting notes, this was the first time I had a strong personal experience from a coffee and sticks with me as one of my most memorable coffee moments. For a little more on my views on building a sensory database – check out my quick piece on Taste Everything from our journal. Tell us your preparation, routine and results in Fushan. With such a short amount of time to prepare for the competition I knew I wanted to reuse a previous routine as the basis of my performance. My 2018 routine had been quite specific to the New Zealand competition so I instead based it on my 2017 routine around ritualisation. I did make some major changes to the content of my routine and narrowed the focus to present more of my Samoan heritage on an international stage. I was also very conscious of competing in a different country on my own and tried to keep my ingredients and techniques relatively simple taking only items that I wouldn’t have to declare at customs. Unfortunately, I was unable to place in the top five at Fushan cup. During my routine, I had some issues with my signature beverage preparation which led to me not being able to serve the full drink and was penalized with several 0’s in that section of the score sheet. This was mainly due to not enough practices of my routine and making a small but crucial change in how I was preparing my signature beverage without testing it! What did you learn from the competition process and the other competitors? It was amazing to meet such passionate baristas from around the world and I’m feeling inspired by their routines, stories and knowledge about coffee. Two competitors stood out for me though, Mathew Levin from Australia and Mauricio Romero from Colombia. Mathew works for Ona Coffee and it was insightful to hear about his preparations for competition and the details and systems in place to make his time on stage as smooth as possible. Mauricio brought such an amazing understanding coffee growing and processing along with a coffee, unlike anything I had tried before. It was a Coffea Eugenioides which is a separate species of coffee from Arabica and was the first time that I had a coffee that was so sweet that it was unbalanced – it tasted like it had a teaspoon of sugar added to it. How did your expectations of Fushan measure up? 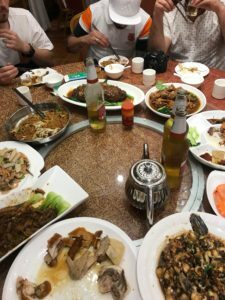 As my first time in Asia, I really didn’t know what to expect from Fushan. One of the things that surprised me was how familiar the food was! Most of the dishes were items I had tried at Chinese restaurants in Auckland. I did find myself craving a salad by the end of the three days there, however, not much in the way of raw vegetables but lots of meat and cooked vegetable dishes every meal. What was the best coffee you had in that city? I was lucky enough to try many of the other’s competitors coffees during our practice times and the Eugenoides was the most interesting along with a Sudan Rume also from Colombia. 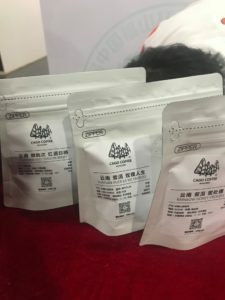 I also really enjoyed cupping some Chinese grown coffees from Yunan including a rainbow honey process which no one was able to explain exactly what this meant. These were specialty grade coffees and well roasted for cupping. Is there anything you would change about the Championship? What feedback would you give to the international organisers? I would have loved more time to prepare for the competition but the other competitors all had a similar amount of time to get ready. I also would have liked the chance to interact with some of attendees and visitors to the competition, perhaps on the spare machine making coffee for a half hour shift or so. What would you like to be doing in five years? Still in coffee? While coffee has always been a part of my hospitality career it’s only been the last four years that I’ve been fully concentrating on it and I’m really enjoying the community and depth of information out there. There seems to be constant new innovations in coffee and a passionate group of coffee professionals across the world. While I have no idea what I’ll be up to in five years, I’m very happy pursuing coffee for now. If you are at all interested in barista competitions give New Zealand Barista Championships a go. My first year I committed to entering without so much as tasting single origin espresso before and I learnt so much about coffee through my practice and preparation. Four years in and I still come away with greater understanding of coffee, develop and refine my techniques and meet inspiring new baristas.